Using Lake Shore as your base and launch pad, custom-build your dream adventure holiday - KAYAKING the longest Lake in the world. Surround yourself with the natural beauty of the Lake by day, eat a well-deserved dinner around a roaring campfire & then fall asleep under the stars on a remote sandy beach by night. With over 10 years experience on Lake Tanganyika, we can facilitate every aspect of this incredible holiday, to make the entire EXPEDITION a seamless and utterly unforgettable experience. Please fill in the basic form below and then submit your form and we will engage you directly, to make your dream trip unfold. This is the longest Lake in the world, weighing in at 670kms. Most expeditions end up averaging between 30-40 km's per day, so to do the whole Lake you would need the better part of a month for your expedition. 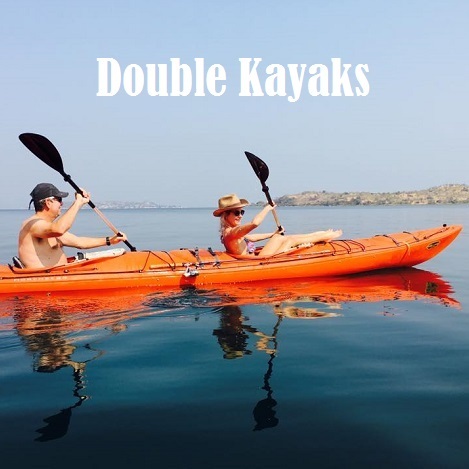 If you have limited time, we can suggest choosing sections of the Lake for you to kayak on, which can take only a week or two, depending on your available time. This section is achieved by the paddlers being taken by boat, south usually starting at Kasanga. Here we camp and then start the expedition the next morning finishing up back at Lake Shore. This section of coast is VERY scenic, with large rocky cliffs, dropping into the Lake, interspersed with long sweeping sandy beaches with intermittent small fishing villages along the way. This is the most popular trip, mostly because it offers paddlers a bucket list opportunity of getting to see CHIMPANZEES in the wild, at Mahale Mountains National Park. This section has three lovely long sweeping bays that we paddle through, sometimes with long sections of dense forest, interspersed with remote sandy beaches. The last day we enter Mahale from the south and the whole day we paddle through the park which is incredibly beautiful. After a day chimp-viewing we arrange a boat transfer back to Lake Shore Lodge. This section is not usually done on its own, it is only normally paddled as part of the end to a longer paddle listed above. The water is generally calmer in the northern bays, giving paddlers amazing days where you feel that you are part of the Lake. A bonus on this leg is passing the Malagarasi river mouth, the third largest river in Tanzania and the largest inflow into Lake Tanganyika. For most expeditions incorporating this leg, we arrange flights from Kigoma back to Dar es Salaam, instead of coming all the way back to Lake Shore Lodge. We have 6 TARPON 140, made by Wilderness Systems. They are very stable, sit-on kayaks with enough carrying capacity for the self-contained paddler. We have 4 Northstar, sit-in kayaks, also by Wilderness Systems. Great for pairs or couples, with enough stowage for you both. Your support boat will leap-frog the paddlers every day. There are three staff on the boat, who will set up camp, prepare delicious hot meals and serve you cold drinks at night. Then after your breakfast, the paddlers set off, the staff will break camp and catch up the paddlers, check that there is nothing anybody needs, then go ahead and set up camp on a remote beach. Mostly, the boat is in mobile signal range so communications are possible with paddlers during the day too. Generally we awake around sunrise, throw a log onto the embers in the fire and heat some water for the mandatory brew of proper coffee. The supported option brings the pleasure of a hot breakfast cooked by our chef. It is best to get away early and to paddle for about 3-4 hours, finding a suitable beach for a lunch break. These breaks give paddlers the opportunity to rest, swim, snorkel and generally recharge, whilst getting a break from the sun and the breeze that usually blows between 11h00 to around 15h00. Then we usually paddle another 2 hours in the late afternoon, arriving at a sandy beach and giving us time to establish camp, wash and make a fire, before we loose daylight. The supported option means that our staff are there to help set up tents and prepare and serve your dinner and drinks. Malaria is found here, so if your doctor recommends anti-malarials please bring enough, however please ask about any/all side effects so that you can be aware of these and counteract any. We have found that there are several brands which cause sensitivity to sun, I suggest avoiding those all together and request a brand that doesn't offer this perky add-on. The most commonly asked question is Required Fitness Levels. Obviously a base level of fitness will be advised because your days are active. Its not just the paddling, its the getting in and out of your boat, it's setting up tents and general busy-ness, so the fitter you are the more fun you will have, but your certainly don't have to spend months training for the expedition - strangely we have found that paddlers develop into the needed level of fitness themselves through being on the trip. Not a day will go by without interacting with local fishermen, wether it be waving back frantically or negotiating how much he needs to part with his beautiful fish for the fire tonight. The Tanzanian people a some of the friendliest most accommodating people on the planet and these daily interactions will form some of the fondest memories of your time here-security is simply NOT an issue. We think the best number of paddlers per expedition is between 4-6 and friends form tighter groups. We will facilitate groups from 2-14 paddlers. Communication is getting easier on the Lake, with the ever-increasing number of mobile towers going up, however it is not continuous and generally if there is comms, data will be available - however, I'm very sure that you didn't come all the way here to obsess over your phone!?! The providers here are Airtel, Vodacom and Halotel. The support boat has a satellite phone on board. Please test all your gadgets before getting here, mostly with regard charging of all your gear. Some paddlers get fixated with gear that won't charge, or that are running low on batteries. Where possible I suggest rechargeable gear and a REALLY good solar charging system. These foldable, waterproof kits, with built in USB's are brilliant in this application, bring two! !